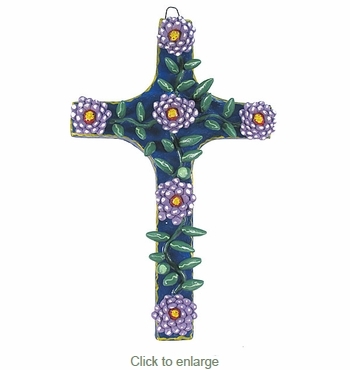 This large hand painted clay floral cross will add the color and spirit of Mexico's religious folk art to your décor. All of our Mexican folk art is handcrafted in Mexico. These Mexican clay folk art creations also make a great gifts. Direct From Mexico will carefully pack your order for safe delivery.